Do I Need to Clean My Engine at the Car Wash? Most of us know that regularly washing a car is a good way to keep it in great shape. Few things beat the feeling of driving a perfectly shiny vehicle out the gates, with a fresh coat of wax to keep you looking great for weeks to come. But what about your engine? There’s no denying that the engine is doing most of the hard work, keeping your vehicle running smoothly with literally thousands of moving parts. And because so many of these parts come into contact with oil, leaking fluids, accumulations of grit, and even debris and chemicals kicked up from the road, they’re understandably dirty. This is especially true if you have any kind of leak in the engine. Fluids (especially oil) are much more likely to draw and trap dirt, creating areas of buildup that can harden over time. Although you don’t need to clean your engine every time you wash your car (especially if you follow a good car wash schedule), you should include this task on your list every few months. Washing an engine isn’t like washing the exterior of a car, where a high-power spray of water and good, soapy scrub go a long way. Because of the many different working parts in an engine, you should be less concerned with blasting every nook and cranny and more concerned with knocking loose and gently spraying away the largest accumulations of dust and grit. 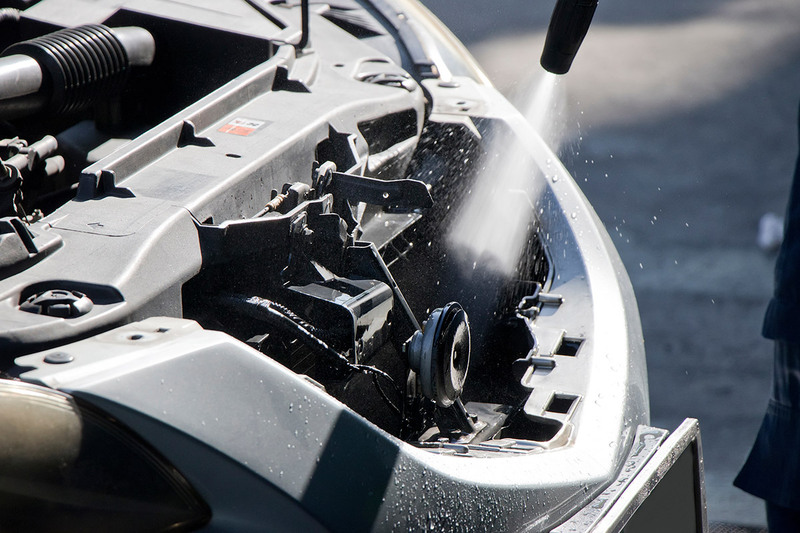 Your car doesn’t have to be cooled down to wash the engine, but you don’t want to introduce cold water directly onto a hot engine, so time your wash carefully. Make the car wash is your first stop of the day or, if you’ve been sitting in hot traffic for a while, park to the side and give your engine a chance to cool before you start the wash. Some people prefer to apply an engine degreaser before they wash, as this will help eliminate the buildup that accumulates over the years. If you regularly wash your engine, however, this step won’t be as important. Utah Auto Spa has an “Engine Cleaner” option in the self-serve bays, which is the ideal way to go about the task. This low-pressure spray has the right temperature and power to clean the engine without doing any damage to the working parts. Remember that the goal isn’t to clear every nook and cranny, but rather to remove those big accumulations that could be working their way into your engine. If you see trouble areas (especially on the battery terminal) or in areas you suspect there might be more extensive damages causing the problem, take your car to an automotive specialist before you clean it. They may be able to clear the dirt for you while taking care of the issue that caused it in the first place. Contact us about our Match Fundraising program, where we’ll match your group’s fund raising efforts dollar-for-dollar!